Resale Mobile Home For Sale In Benidorm (Close to Albir & Altea). SOLD SOLD SOLD!! Residential Resale Aitana Mobile Home For Sale On Camping Almafra Mobile Home Park In Benidorm, Costa Blanca, Spain. 2 bedroom residential Mobile Home situated in a quiet residential area of the Campsite. Aitana Mobile Homes/ Park Homes are manufactured specifically for residential living, with underfloor insulation, double glazed windows with shutters & insect nets, PVC exterior door & residential fixtures & fittings. The home has a large central open plan lounge/ diner/ kitchen, 1 bathroom (en-suite to the master bedroom) and 1 shower room. The Bathroom has a plumbed in washing machine. The kitchen comes fully equipped with built in oven/hob and fridge freezer, Dining table & 4 chairs. Both bedrooms have air conditioning units, fitted wardrobes and freestanding bedroom furniture. The exterior has decking with garden furniture and a space at the front to accommodate 1 car. Interested In This Park Home? 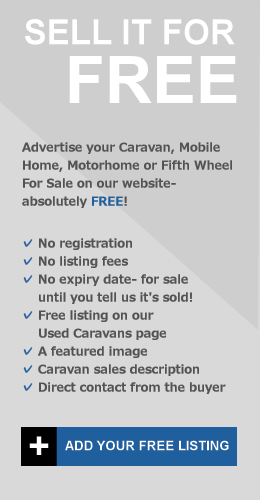 Contact Seller Directly By Filling Out The Contact Form Below..
Resale Mobile Homes For Sale In Benidorm, Albir & Altea. Benidorm Park Homes. 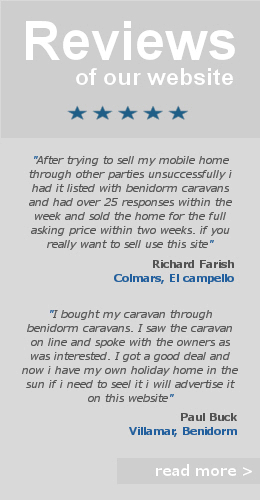 Residential Static Caravans Spain.